While reading My Life in France, you can’t not fall in love with this brave woman whose approach to both cooking and life is sweet, honest, persistent and passionate. In the 1940’s, Julia Child moved to Paris because of her husband’s job. She didn’t speak French, was in her late 30s and somehow felt the need to reinvent herself. It took her a while to find her passion, but when she did, she went full force ahead! Her complete devotion to cooking and teaching created the success story that has inspired so many, including me. Living in New York before I was married, my roommate and I would sometimes cook dinner with Julia by setting up old episodes of The French Chef on the laptop on the kitchen counter. We were inevitably crying with laughter by the end of the show- she’s amazing. She would have been 100 years old today. 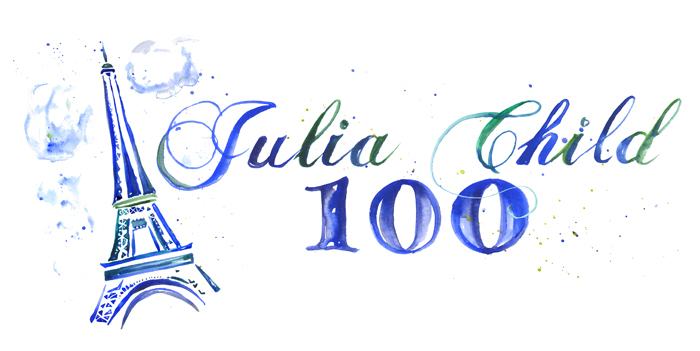 Bon Anniversaire, Julia!